a threat to the outdoor education course at Blue Mountains TAFE? Many people with connection to the Alps have passed through the Blue Mountains outdoor education course. The following article comes from the Blue Mountains Gazette, and highlights a recently revealed threat to the course. A threat to shut down the 15-year-old outdoor education course at Blue Mountains TAFE, as part of sweeping State Government cuts to education, was a short-sighted decision say angry Mountains adventure tourism operators. The move, leaked on a College Alumni Facebook wall last week, was met with resounding disbelief by the tourism industry and current and former students. Mr Jones said tourists came to the region because of the huge drawcard of adventurous activities offered by companies like his. Aidan McGarry, owner of High and Wild which has been operating in Katoomba for 22 years, agreed, saying 10-15,000 people came to the Mountains annually for these types of experiences and he was “appalled” that the decision could be made without consultation. Twelve years ago, Ben Griggs, now 37 and living in Queensland, completed the 12-month course at a subsidised price of $180 and says it changed his life. “To me they’re trying to save money and I appreciate that, but I just don’t think they understand the value of that leadership training,” Mr Griggs said. The course enabled him to work for more than a decade and he still supplements his current small business income as a video operator with adventure work. A course teacher Adam Darragh placed the original post on the Facebook site, a site he said was set up by a former teacher. He said he understood core TAFE funding would be cut to the course “because it was one of the most expensive (due to excursions)”. Current course participant Tim Williams who hoped to get his diploma next year is “shattered” by the move and worried for other students, some who have come as far as Western Australia, to do the course. Tourism operators told the Gazette that other courses were available at Lithgow and Sydney but none covered the final Certificate Four advanced requirements in abseiling, canyoning and rock climbing — skills the guides need. 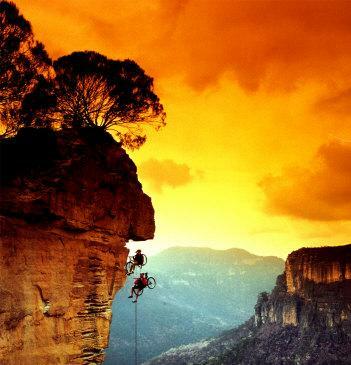 “Ninety per cent of staff up and down Katoomba Street working in abseiling, rockclimbing and canyoning have done this course and were trained at the (western Sydney) Institute (based at Wentworth Falls),” Mr Jones, who is also a board member of the NSW Outdoor Recreation Industry Council and a director of Blue Mountains Lithgow Oberon Tourism, said. TAFE spokesman Craig McCallum said TAFE had made no decision on the course but he did not confirm whether it would run next year. He said they were looking at the best ways to respond to the education cuts. “We are in the process of consulting with our staff as to the best ways the Institute can respond to reform changes announced by the Minister for Education on September 11. TAFE NSW – WSI is also awaiting the final recommendations from the Smart and Skilled skills reform . . . to meet the current and future jobs and skills needs in western Sydney and NSW. Randall Walker, Chairman of Blue Mountains Lithgow and Oberon Tourism estimated guided, active adventure and tour experiences contributed about $25m of the $500m annual tourism industry but added he “had no reason to believe the department was closing”. Blue Mountains MP Roza Sage responded to criticisms by saying she had “sent through to the minister’s office concerns from the community that have been raised with me”. Mr Darragh said he was “excited if the decision hasn’t been finalised”.